Recently we got to do something I imagine would make girls jealous all over the world – we caught up with the biggest heartthrob on screen, Robert Pattinson! He was there to discuss his new film Water For Elephants. 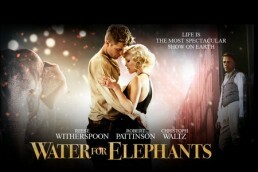 Water For Elephants, based on the novel by Sara Gruen, is set during the Great Depression, and follows the story of Jacob (Robert Pattinson), a penniless 23-year-old veterinary school student who ends up getting a job with a second-rate travelling circus. He falls in love with Marlena (Reese Witherspoon), one of the show’s star performers, but their romance is complicated by Marlena’s husband, the circus boss (Christoph Waltz). Want to meet the stars like Josh did? Then sign up to FILMCLUB.